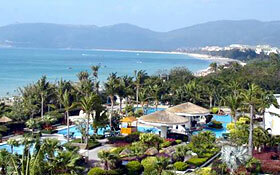 Sanya hotels: discount reservation system offered by chinahotelsreservation. Sanya: accurate description about the requirements regarding your stay, comprised suggestions and appropriate solutions for hotels and rooms accommodation. 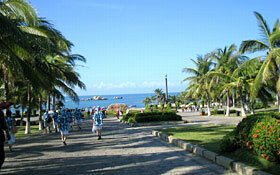 For detailed Sanya hotel information or to reserve a hotel please click on Sanya Hotels list. Sanya Travel: Sanya has collected 10 big sceneries resources such as the sunlight, the sea water, the sand beach, the climate, the forest, the animal, the hot spring, the grotto, the countryside, the wind and the rich historical culture resources; it is the Chinese tropics seashore scenery traveling resources crowded area. The famous scenic are site ends of the earth, march into the tour area, bluish gray color megalith impressively person item which in the sand beach that pair rises straight from the ground, two stones inscribe separately the inscription of "the horizon" and "the cape", its mean edge of the day, the sea terminus. Here melts the blue water, the blue sky in a color, the smoke wave is vast, sail shade spot. The coconut tree and forest dances, the wonderful stone stands in great numbers, like poem and beautiful picture. Here has the Yalongwan travel area of the state-level which only to have tropics character and style in our country; There have the Nanshan culture park which said as the image of Buddhism country in Sanya; Wutzushan which always has the name of "the Hainan ridge"; The park of deer turns head, the seamount marvelous sight scenic spot, the Sanya bay scenic spot, the hole of starts to write, Nantian hot spring, the coconut tree continent island, the Wuqi continent island seascape paradise, all are the Sanya traveling hot spots, In addition, there are humanities landscape and so on statue in the Yazhou ancient city which the Confucian temple Jianzhen Buddhist travels to the east of Japan took shelter from wind lands.